I can’t begin to tell you how excited I am to finally get my hands on some fresh figs! I’ve been obsessed with making this pasta dish ever since my mom made it for us, in Brazil, when we were visiting during the holidays. As soon as the weather began getting warmer, I started to look for figs, because I read somewhere that they have a short season in early summer and a main season from late summer until fall. As we got deeper into the sunny season, I started to feel impatient because I was seeing ZERO figs. So I made my husband drive me to several grocery stores and farmer’s markets just to feel incredibly disappointed that all I was seeing were tomatoes and peaches. “Where are the figs?? ?”, I would hopelessly ask my local farmer’s market guy, who would look at me pitifully and promise to bring it “next week”. Needless to say, next week would come and no figs. “Next week, I promise”, he would mutter under his breath, afraid of my dragon eyes. Well, I am happy to report that the farmer’s market guy’s life is safe because I found figs at Whole Foods. Thank you, Whole Foods, for caring about us fig obsessed people. I guess you never know how much you love something until you can’t have it! Now that I think about it, I was never too fond of figs until recently. It’s not that I disliked them, but I have serious flashbacks of my grandmother peeling/cutting some figs and offering them to me, still attached to the knife, while I politely refused, more interested in munching on some cookies or chocolate. And God forbid someone would try to get me to eat figs in a salad or savory dish! With the exception of Christmas food, fruits were supposed to be eaten as dessert, never in a savory way! Oh, isn’t it funny how we change? I don’t know if it’s because my palate got more sophisticated due to my food blogging journey or if it’s the fact that I moved to a different country, where fresh fruits and vegetables are not as widely available as they were in my tropical homeland. All I know is that I am now obsessed with these sweet, pulpy fleshed little godsend purple (or green) fruits. Seriously, give me ALL THE FIGS! By itself, in dessert, in salads, in pasta and/or in cocktails. I need to make up for all the lost time! Once I got my beloved figs, it was time to pay a visit to my favorite place in the neighborhood: this little family owned Italian deli, where they sell all kinds of Italian goods and sliced prosciutto just like my uncle Alfredo used to do. Thin, buttery textured, melt in your mouth, salty prosciutto is one of our favorite treats. 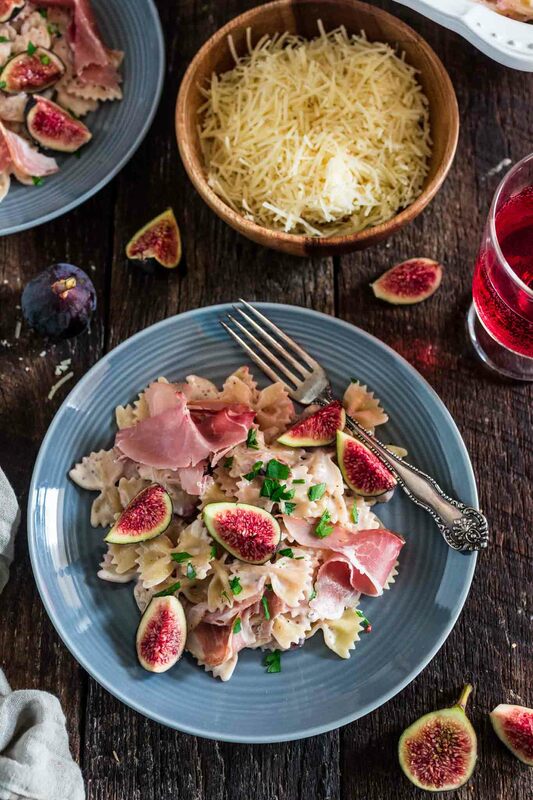 And if it’s paired with fresh figs in a creamy pasta dish, then it is pure nirvana, my friends! ? How could something so simple taste so damn good? All that is to it is sautéing some sliced figs until they are slightly browned, then adding heavy cream and lemon juice and cooking until thickened. 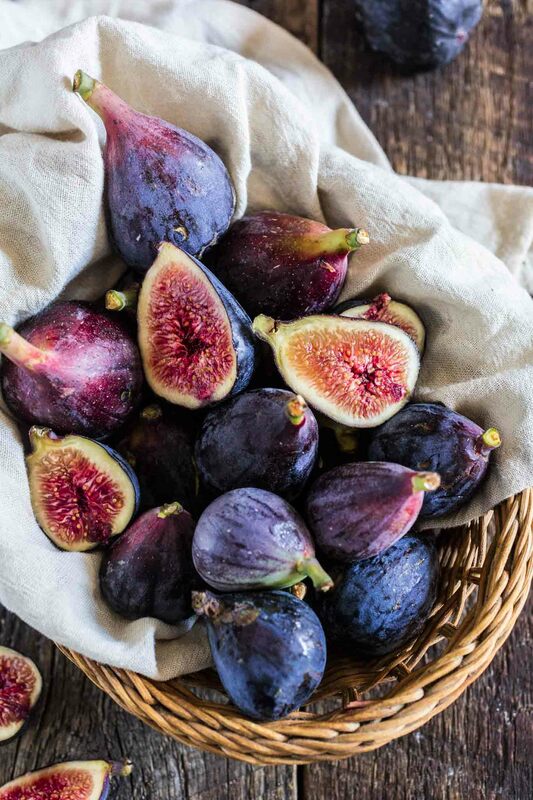 If your figs are perfectly ripe like mine were, they will fall apart in the sauce, and that’s totally okay, because that means your sauce will get even creamier, sweet and a beautiful light pink color. 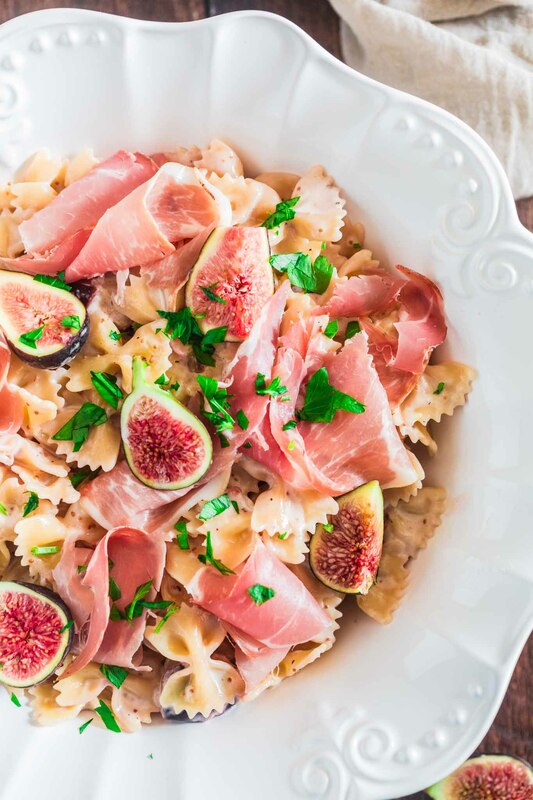 Toss your favorite pasta in this cream and top with more fresh figs and prosciutto. Oh, and don’t forget the toasted pine nuts! No, you are not blind. There are no pine nuts in my pictures because I completely forgot to add them. Yep, I made my husband drive me to the grocery store at 11pm to get pine nuts and forgot to use them! Yay, me! ??? But try to remember to add them – I’ll write it in the recipe – because I think a little crunchy texture would make this dish ever better. If that’s even possible! I am not a pasta salad girl, but if that’s your thing, this dish could totally be served cold. You can even add some peppery arugula and voila: the perfect summer pasta salad for your next outdoor gathering. 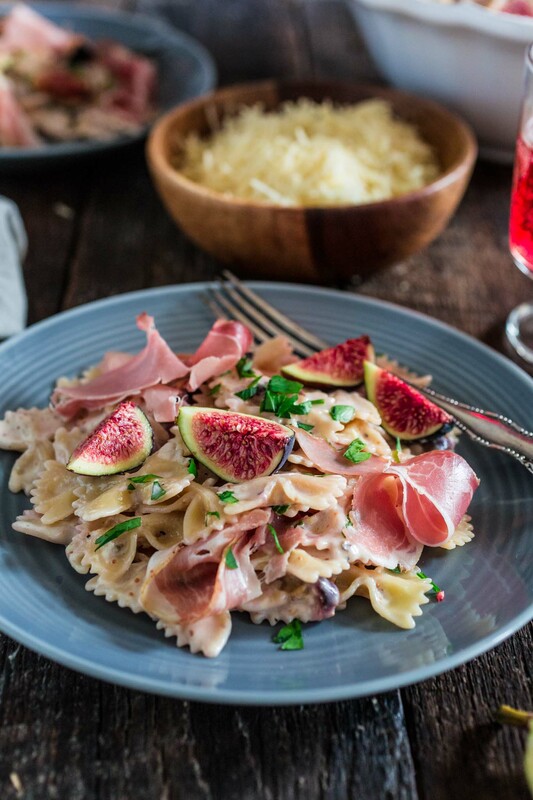 For me, a bowl of hot farfalle with fresh figs and prosciutto plus a glass of chilled white or rose wine equals a nice alfresco dining in the balcony on a summer evening! That, right there, is the picture of something worth waiting all year for (and annoying the sh*t out of your farmer’s market guy!). Start by thinly slicing the prosciutto into strips. Reserve. In a large sauté pan, over medium heat, heat the olive oil and melt the butter. Sauté the fig slices until slightly browned, about 2 minutes, and season with salt and pepper. Then, add the heavy cream and lemon juice and once it starts boiling, lower the heat to medium-low and continue cooking until slightly thickened and the figs begin to break down, about 4 minutes. Keep warm while you cook the pasta. Place a large pot of lightly salted water on to boil. Cook the pasta according to package instructions, until it is "al dente". Drain, reserving about 1/2 cup of pasta water, and transfer the pasta to the sauté pan with the creamy sauce. Toss the pasta with the sauce and transfer to a serving dish. 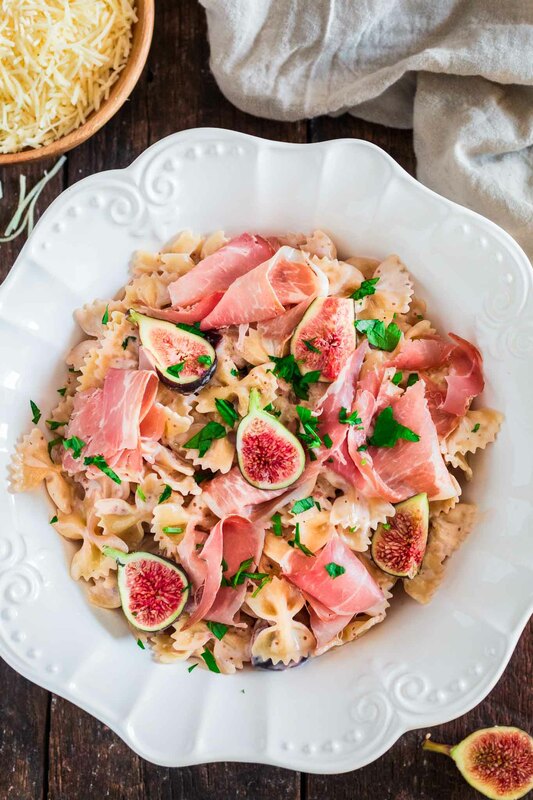 Top with halved (or quartered) fresh figs and prosciutto. Finish off with toasted pine nuts and a sprinkle of chopped parsley. Serve immediately with extra Parmigiano Reggiano at the table.